by Harriet Perkins, 2nd year student, MPhil Textile Conservation. When a conservator is first presented with an object it is important to find out as much information about it as possible. This informs the conservator of the significance of the object, construction and materials used as well as indicating the causes of deterioration. As part of the 2nd year we take a course called Deconstructing the Artefact which aims, amongst other things, to broadening our knowledge of the chemical and physical properties of common materials beside fibres encountered in mixed material textile artefacts. For one of the assignments we were tasked with researching one object each. My object for investigation was a bottle/pendant ( GLAHM 112806 ) which belongs to the collection of the Hunterian Museum in Glasgow. 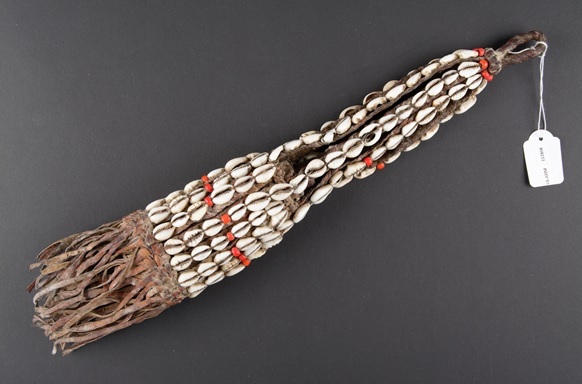 The object, measuring 450mm long, was made of braided leather with cowrie shells and red beads and a leather bottle stop. The outside was coated in unknown white deposits. On first look at the object I did not know what the object was for or what the white deposits were. I used the two main types of research, historical and scientific, to find out information about the object. GLAHM 112806 © University of Glasgow. Image reproduced courtesy of The Hunterian, University of Glasgow 2016. .Historical Research included finding similar objects in other museum collections which taught me that the object was a kohl pot holder. Looking into kohl I found that it is a traditional eyeliner which has been used widely throughout the Middle East, North Africa and South and East Asia. When I took the bottle stopper out I was surprised and amazed to see a small wooden stick with a black powder encrusted onto the end, strongly indicating the use as a kohl pot. I also found out that kohl is traditionally from a ground down version of the stone Galena (Chemical formula PbS). A test for lead in the black substance could confirm this beyond reasonable doubt and suggest health and safety implications should be looked into. As well as the use of the object, I also researched where the kohl pot was likely to have been made. It had been thought to have been made in Botswana as it was collected there. However, through my research I found a similar example, a makhala/kohl container, in the collection of the British Museum, which is known to have originated from Yemen. 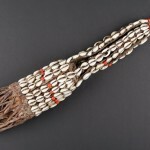 Subsequently I looked further into Middle Eastern crafts and found that the Hijaz region in Saudi Arabia is well known for making objects from braided leather and kohl eye liner is used widely here also. Although this is not a definitive conclusion, this leads me to believe that the Hijaz region is highly likely to be where this pot was made. Scientific Research was particularly important when looking into the cause of the white deposits and I was particularly worried they were due to mould. By looking at the sample under a microscope I was able to rule out the possibility of the deposits being mould and confirm they were made up of crystals. At the CTC, we are lucky enough to have an FTIR machine for material analysis. By comparing the absorption peaks with waxes and resins it was clear that the deposits were an organic fatty acid, likely to be Stearic acid. 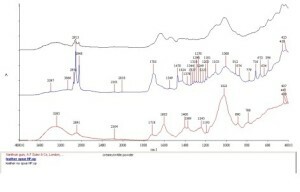 As Stearic acid could be from many different sources, Gas Chromatography-Mass Spectroscopy would be able to determine whether the origin of the fatty acid is from previous conservation or traditional leather making. 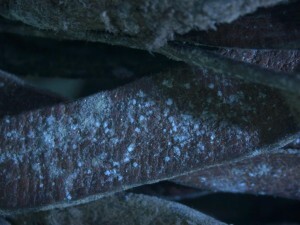 Knowing whether the stearic acid is from one of the traditional leather making/maintaining techniques or from previous conservation would make a difference when deciding whether to remove it or not. Whilst working on this project I was fascinated by the way both historical and scientific knowledge together was needed rather than just one. Utilising both research methods together enabled me to gain a much deeper understanding, not only of the physical object today, but also its historical significance, the way it was used and, by extension, an insight the culture in which it was created.